Another day, another blog thing to talk about. 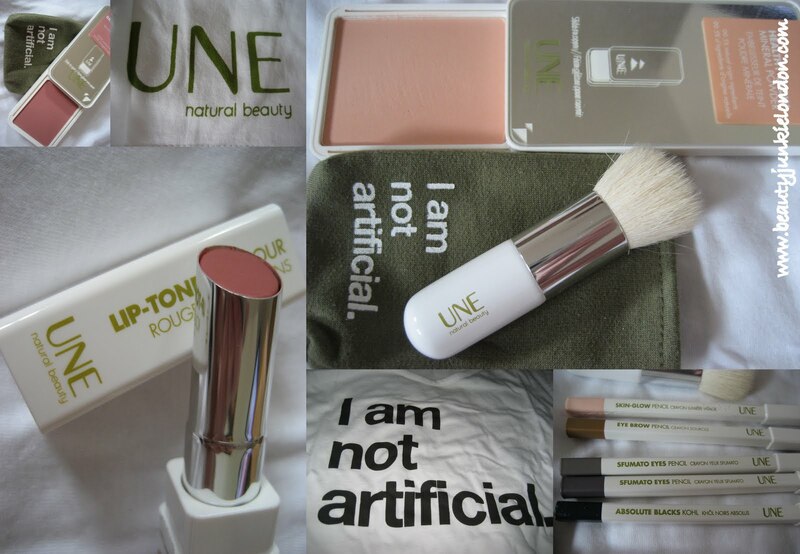 Today I have been back to Bourjois HQ along with a gaggle of other bloggers to be introduced to Une, a new range being released from the company that boasts between 98-100% natural credentials. The range is totally different to everything from Bourjois – all the colours are really pure and natural and going back to basics, with the idea of the make-up being there the enhance what you already have rather than mask things you don’t like. At the event the Bourjois PR team talked us through the various products, the colours and textures and the thinking behind the range. Whilst a freelance make-up artist demonstrated them in use. We were then given free reign to play with the products and pick out a selection to take home and test out in our own time. My first impressions of the packaging is that it is quite slick – the healthy glow mineral powder and the blushers especially as they have decent sized mirrors (the powders are a similar size to an iphone) on the top that slide back to reveal the product. For this alone I can see these making it into my make-up bag as a decent sized mirror with a product is all too hard to come by. Having been able to play with the selection of products the stand-outs from the range for me are the eye pencils and the blushers. In particular one of the Absolute Blacks Kohl – in shade K07 (catchy name), this a real inky-black shade with blue undertones. Incredibly pigmented, this was probably the number one product I was keen to test out. So, after the event I was going out so I gave this liner a test run and it fared really well. It lasted all night in the waterline with no smudging. I absolutely adore the colour of this liner – I think it’s perfect for anyone who has blue eyes and can see myself reaching for this on a regular basis. The blushers are cream-to-powder, similar in some ways to the Topshop ones, but the colours are far more natural toned. Of the four shades the colours all look darker in the pan but swatch more sheer – they are very creamy and blend really easily. I want to give these a proper test to see how they last, I always have the feeling that cream blushes just wont last long enough – so I will wear these for a few work days and see how they hold up. I have already given the lippie a bit of a test – another one that I wore on the evening of the event (Saturday night). The colour is extremely natural, very much a my-lip-but-better shade, which I really like with my general aversion to bright colours (other than the occasional coral…) it applied smoothly, isn’t hugely pigmented but enough colour to make it worthwhile and lasted reasonably well. One of my friends applied the same shade and it suited her equally well, despite having totally different colouring – a plus of the versatility of a neutral shade range. Once I have had chance to give some of the other bits a decent test I will do a thorough review with pictures and swatches, but for now hopefully this will be enough information to determine if it’s a range you want to check out. Personally, as a natural shade fan I like the whole ethos behind it – and having seen the range there are some stand out products, I don’t love it all – some of the shadows are too sheer and the liquid foundations didn’t really jump out at me – but there are some unique products that I am so far, quite impressed by. Will report back when I have given a few more bits a proper test. Products mentioned in this post provided for review. All opinions are honest and my own. So there. I like the sound of all of this range! Do you know when it is going to be in the shops? Yes, when will it go out in the market and how much is it? The prices are from £4 to £13 and in stores now across the UK!